Shown on this page are two watercolour paintings from the Fellows' family album in the Nottinghamshire Archives Office (whose permission to copy is gratefully acknowledged, ref DD/752/1). 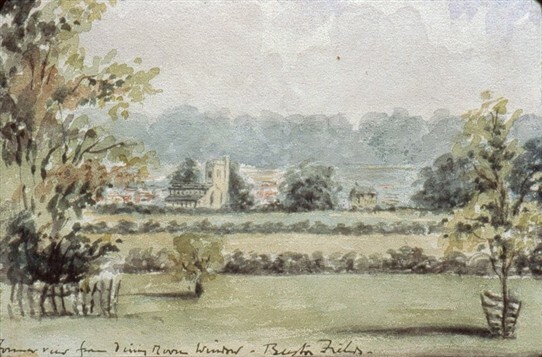 They show the view from their house at Beeston Fields, now the golf club house, in the middle of the nineteenth century. There appear to have been no houses then between Beeston Fields and the parish church! The family’s residence in this area started when Samuel Fellows (1687-1765) came from London to Nottingham as an apprentice framework knitter. He later started the family’s hosiery business and rose to high status in the town, becoming Sheriff in 1729, Coroner in 1754 and Mayor 1755/6. He was followed in this trade and as Sheriffs and/or Mayors by a son (1727-1791) and grandson (1756-1823), both named John. They all lived on High Pavement at what became the Judges’ residence and then the Nottinghamshire Archives Office But the grandson bought Manor Lodge in Beeston in 1802 and land which was consolidated at the time of enclosure of Beeston’s open fields in 1809 to form the Beeston Fields estate of 57 acres, later known as the Belle Vue estate. At Alfred’s death, the property passed to his three sons John, Henry and George, but George bought out his brothers and, in 1885 he added a large west wing to the house. In 1911 he sold the estate to Sir Albert Ball (father of the first world war ace Albert Ball VC) who soon sold it to Frank Bowden, the founder of Raleigh Cycles. Frank was created a baronet in 1915 and moved to Bestwood Lodge. So his son Harold sold the estate in 1923 to Frederick Mitchell who acquired more adjacent land and created the present-day golf course, which opened in December 1923. 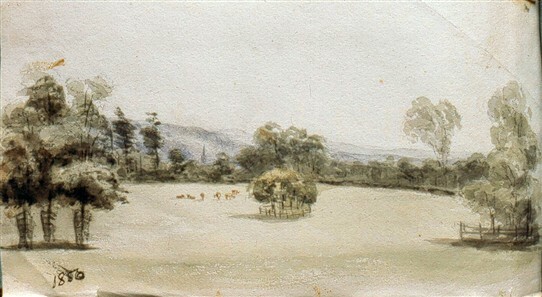 The watercolours were possibly painted by one of Alfred’s two daughters, Sarah (1834-?) or Elizabeth (1835-1890). This page was added by Alice Cave on 19/09/2011.